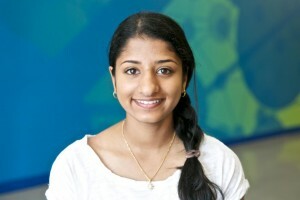 Meena Reddy just finished her junior year at Tesla STEM High School. She has been interested in science since junior high, and is especially interested in the intersections between different scientific disciplines and engineering. When she first learned about ISB, she was incredibly excited for the opportunity to work in a place built around combining scientific specialties to solve pressing problems. During the internship, she was able to use her interest in environmental science and biology to conduct experiments on the biofuel-producing algae Chlamydomonas reinhardtii in order to maximize its lipid production. She also assisted in the monitoring of an aquaponics system to be used in the classroom. Outside of the lab, Meena participates in her own research projects for organizations like the Washington State Science Fair, in which she recently entered a project which combined aspects of behavior psychology with environmental science. She is also interested in helping the world around her, and serves as the secretary for her school’s Model United Nations club when she isn’t volunteering at a variety of different places. To relax, Meena loves to play tennis, listen to music, or head up to the Snoqualmie ski slopes, where she has worked as a ski instructor for the past four years. In the future, she hopes to pursue a STEM-related career.